EXCLUSIVE PICS OF COJO SHARK MASSACRE!!! You are here: Home / Attack Locations / California / EXCLUSIVE PICS OF COJO SHARK MASSACRE!!! More carnage from frightening Northern Santa Barbara County, as the devastated carcass of yet another shark attack victim washes ashore. 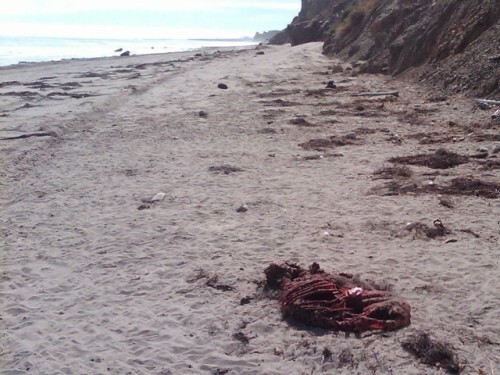 The following picture was sent in by a dedicated Fear Beneath reader who investigated the rotting mass of flesh and found evidence of extensive Great White Shark injuries. Our dedicated readers are familiar with our on-going coverage of the Bixby and Cojo Ranches, and the prolific quantities of Great White Shark activity associated with the area. It has long been the position of this website and its employees that the risks of entering the water anywhere in between Goleta and Pismo Beach is virtually suicide – with the frequency of massive Great White Shark sightings and their propensity for consuming the locals, even walking on the beach is an insane risk. Not worth it. Anyone who treats life with such a cavalier attitude deserves to become the next meal of… the Fear Beneath.